Preheat the oven to 350°F. Place the almonds on a baking sheet and toast until fragrant and just golden, about 8 minutes. Remove to a bowl to cool, then chop very finely either by hand or in a food processor. If you use a food processor, be careful not to pulse too much or you’ll end up with nut butter. Meanwhile, chop the peaches into a very fine dice. Place in a small mixing bowl and add the fresh goat cheese. Use a silicone spatula to mix very well. Shape the goat cheese-peach mixture into 1-inch balls with your hands. You may need to run your hands under cold water occasionally, to prevent balls from sticking. If peach pieces fall out, wedge them back in. 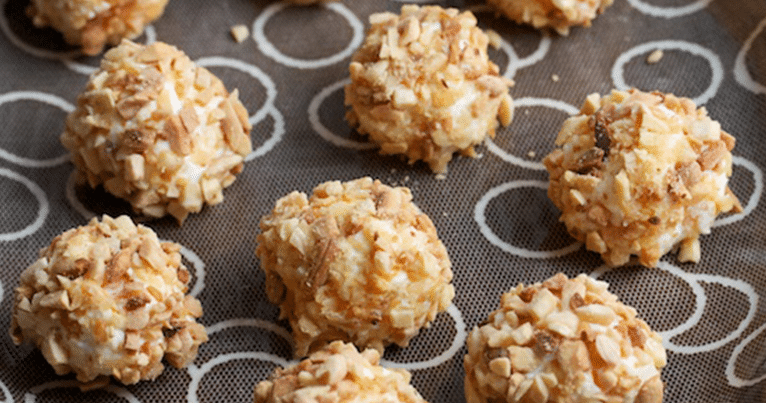 Place the chopped almonds on a plate and roll the cheese balls through to coat completely. Set on a platter and refrigerate until ready to serve. Make the balsamic drizzle: place the vinegar and syrup in a saucepan and bring to a boil. Decrease the heat to low and simmer for 2 minutes, until syrupy. Scrape into a little bowl to cool. Drizzle each ball with some syrup before serving.